Staten Island, NY (March 21, 2019) – Two people, including a firefighter, were reported to have suffered at least minor injuries in a fire that broke out at the West Brighton Houses on Thursday morning, March 21st. The blaze was stated to have begun at 12:52 a.m. when authorities dispatched emergency responders to the scene. 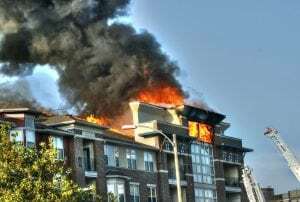 According to authorities, firefighters and paramedics were sent to the scene of the fire at 780 Henderson Avenue for a fire located on the third floor of the eight-story building. Emergency medical crews arrived in order to assist any victims and were reported to have transported a civilian and a firefighter to Staten Island University Hospital in Ocean Breeze. 12 units and around 60 firefighters responded to the blaze where they were able to take control of the flames within approximately one hour. The cause of the fire is currently under investigation by authorities. We would first like to extend our deepest sympathies to both victims of this fire as we hope for full recoveries. At this time, we would like to offer our sincere appreciation to the courageous firefighters who risk their lives each day for the fellow members of our community. Many fires and explosions in New York prove to be critically injurious or fatal, as they are one of the most dangerous situations that anyone may face at any time. After such a perilous event, it is essential to realize that you may have the right to be compensated, particularly if your pain has been caused by the inattentive or criminal actions of another party or entity. At Hach & Rose, we understand that there are few things as challenging as dealing with an unexpected injury, and we are here for you 24/7 to answer any questions you may have. If you have been hurt in a New York fire or explosion due to no fault of your own, please call 212-779-0057 today.